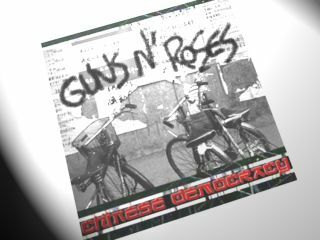 A fan-made mock-up of the Chinese Democracy cover. It won't look like this, but will it sound better than what we've heard? Guns N' Roses. Chinese Democracy. November release. Could it be? If all indications are correct, the answer is a firm "yes." And you can mark November 25 as the date to remember on your calender. According to sources close to the situation, Chinese Democracy, which has been in production for over 14 years, at a cost of umpteen millions dollars, will be available exclusively in the US at Best Buy stores. It is said that the band's co-manager, Andy Gould (who works the group along with uber-manager Irving Azoff), informed 900 employees of the retail giant at a vendor convention in Dallas, Texas of the imminent release - and then played them three songs from the finished record. Gould is also reported to have told executives at Best Buy that a new song, If The World, will be featured in the closing credits of the forthcoming movie, Body Of Lies, which stars Russell Crowe and Leonardo DiCaprio. Gould also said that If The World was Axl Rose's favorite song. From reports, it was the best received track amongst Best Buy employees. In US politics, we have what's known as the "October surprise" - stunning news that turns an election on its head. But if Axl Rose - er, Guns N' Roses - are indeed releasing the endlessly awaited Chinese Democracy before the year's end, then we now have what will be known as the "November surprise." PDA recordings of If The World - seemingly made by Best Buy staff attendees of the playback - appeared briefly on YouTube 26-27 September, but they have now been removed. The message on YouTube reads: " This video is no longer available due to a copyright claim by UziSuicidal LLC". MusicRadar has called the office of co-manager Andy Gould to ask for clarification on release plans, but he has so far declined to respond.